Join us, traveler, on an epic quest. We seek the Fountains of Sustainability. In a few crannies of our little blue world, things are looking up. We must journey together to find these rare gems and bring them to light, showing the rest of the world how we may yet save ourselves. The Central American nation has long flaunted its green heart to the world, by pioneering the Ecotourism movement, then promising carbon neutrality by 2021. So far in 2015, though, our sibling to the south has blown us out of...err, into....the water by burning no fossil fuels to generate electricity, instead running on hydroelectric power and other renewable energy sources. By comparison, the United States uses about 10% renewable energy. Costa Rica's current 100% renewable streak will probably end with the rainy season, when hydroelectric plants stop generating so much electricity. In an ugly twist, climate change is already causing unpredictable rain patterns that make this type of renewable power less consistent. Still, Costa Rica's standout season shows the rest of us what can happen when a country is willing to put political muscle behind sustainability, as well as play to its geographic strengths: in this case... damn many dammable rivers. 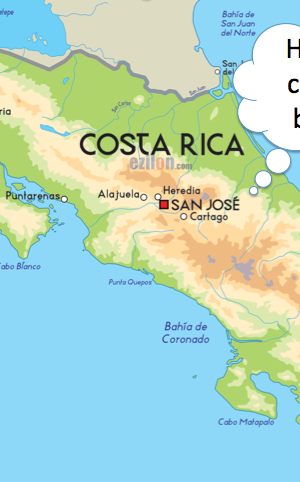 Stay classy, Costa Rica, and stay with us, travelers as we venture across the Earth in the coming weeks.